'Wicked Plants' Creep Through Brooklyn Gardens Wicked Plants is a new book documenting the sometimes deadly plant kingdom. 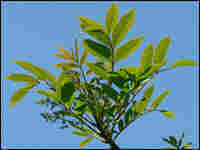 Author Amy Stewart writes about illegal, dangerous and toxic species, including oleander and poison sumac. This summer, the Brooklyn Botanic Garden features some of these "evil" plants skulking among its lily ponds and greenhouses. Jimson weed was named after Jamestown, where the colonists landed. It's said many of the first settlers got sick after being exposed to this plant. Years later, they apparently gave jimson weed to British soldiers, who were incapacitated for days. The poison sumac tree apparently changed the life of one of the designers of New York's Central Park, Frederick Law Olmsted. Things are not as placid and peaceful in the plant kingdom as you might believe. Beyond the flowers, butterflies and vegetables, something dark is lurking in the garden. 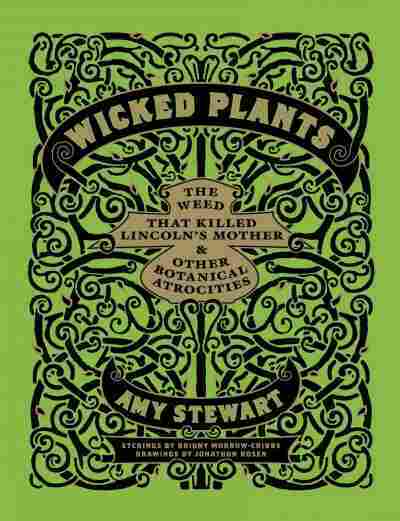 In her new book, Wicked Plants: The Weed That Killed Lincoln's Mother and Other Botanical Atrocities, author Amy Stewart focuses on plants that are illegal, dangerous — even deadly. Stewart says people don't realize that many plants have protective poisons to defend themselves from bugs and animals, including humans. For instance, oleander may have beautiful flowers, but if you ingest enough of it, your heart will stop. "There's a woman in Southern California who tried to murder her husband with oleander," says Stewart, who has written several books on gardening. She says the woman's plan didn't work because she didn't give him enough. "He landed in the hospital and he survived," she says. "Then she killed him with antifreeze." Stewart says the woman is on death row. This summer, the Brooklyn Botanic Garden is showcasing many of these "evil plants" among its lily ponds and greenhouses. They feature scores of examples of plants that make you sick, make you hallucinate, and a few that can even kill. Though there are no illegal plants, like cannabis, the garden does have some that are dangerous, like jimson weed. It's said that jimson weed, named after Jamestown, made many of the first settlers sick. As she runs her fingers through a beautiful hedge of yew at the garden, Stewart says the innocent-looking plant is quite poisonous if eaten. She's learned to be careful by wearing gloves. She recalls becoming dizzy one day while wandering through a field of tobacco. "It was like being covered with nicotine patches," she says. "My heart started racing." Next to one beautiful tree at the Botanic Garden is a sign with a skull and crossbones. 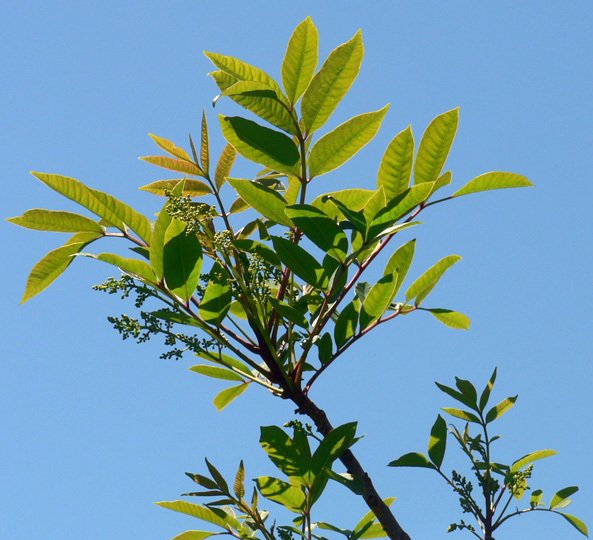 It's poison sumac, and Stewart says the plant changed the life of Frederick Law Olmsted, who designed New York's Central Park. Wandering through the fields of poison sumac damaged Olmsted's eyesight, causing him to stay out of school for a year — time he spent getting interested in landscape architecture. A tree sheds poison daggers; a glistening red seed stops the heart; a shrub causes intolerable pain; a vine intoxicates; a leaf triggers a war. Within the plant kingdom lurk unfathomable evils. In his 1844 story "Rappaccini's Daughter," Nathaniel Hawthorne described an elderly doctor who tended a mysterious walled garden of poisonous plants. The old man's demeanor in the presence of his shrubs and vines "was that of one walking among malignant influences, such as savage beasts, or deadly snakes, or evil spirits, which, should he allow them one moment of license, would wreak upon him some terrible fatality." The story's hero, young Giovanni, watched from a window and found it most disturbing "to see this air of insecurity in a person cultivating a garden, that most simple and innocent of human toils." Innocent? This is how Giovanni viewed the luxuriant vegetation below his window, and it is how most of us approach our gardens and the plants we encounter in the wild: with a kind of naïve trust. We would never pick up a discarded coffee cup from the sidewalk and drink from it, but on a hike we'll nibble unfamiliar berries as if they had been placed there for our appetites alone. We'll brew a medicinal tea from unrecognizable bark and leaves that a friend passes along, assuming that anything natural must be safe. And when a baby comes home, we rush to add safety caps to electrical outlets but ignore the houseplant in the kitchen and the shrub by the front door—this in spite of the fact that 3,900 people are injured annually by electrical outlets, while 68,847 are poisoned by plants. You can garden for years without ever suffering the ill effects of a plant like monkshood, whose cheerful blue flowers conceal a toxin that brings on death by asphyxiation. You can hike for miles and never encounter the coyotillo shrub, whose berries cause a slow but deadly paralysis. But someday, the plant kingdom's dark side may make itself known to you. When it does, you should be prepared. I didn't write this book to scare people away from the outdoors. Quite the opposite is true. I think that we all benefit from spending more time in nature—but we should also understand its power. I live on the rugged northern California coast, and every summer the Pacific Ocean sneaks up behind a family enjoying a day at the beach and claims a life. Those of us who live here know that so-called sleeper waves can kill with no warning. I love the ocean, but I never turn my back on it. Plants deserve the same kind of guarded respect. They can nourish and heal, but they can also destroy. Some of the plants in this book have quite a scandalous history. A weed killed Abraham Lincoln's mother. A shrub nearly blinded Frederick Law Olmsted, America's most famous landscape architect. A flowering bulb sickened members of the Lewis and Clark expedition. Poison hemlock killed Socrates, and the most wicked weed of all—tobacco—has claimed ninety million lives. A stimulating little bush in Colombia and Bolivia called Erythroxylum coca has fueled a global drug war, and hellebore was used by the ancient Greeks in one of the earliest instances of chemical warfare. Plants that are monstrously ill-mannered deserve recognition, too: kudzu has devoured cars and buildings in the American South, and a seaweed known as killer algae escaped from Jacques Cousteau's aquarium in Monaco and continues to smother ocean floors around the world. The horrid corpse flower reeks of dead bodies; the carnivorous Nepenthes truncata can devour a mouse; and the whistling thorn acacia harbors an army of aggressive ants that attack anyone who comes near the tree. Even a few interlopers from outside the plant kingdom—hallucinogenic mushrooms, toxic algae—merit inclusion here for their wicked ways. If this book entertains, alarms, and enlightens you, I've done my job. I'm not a botanist or a scientist but rather a writer and a gardener who is fascinated by the natural world. These are most fascinating and evil plants from among thousands that grow around the world. If you're in the market for a comprehensive poisonous plant identification guide, I've included a special section for you in the bibliography. And if you suspect that someone has been poisoned by a plant, please do not spend precious time flipping through this book in search of symptoms or a diagnosis. While I describe the possible or probable effects of many toxins, their potency can vary widely depending on the plant's size, the time of day, the temperature, the part of the plant in question, and how it was ingested. Don't try to figure it out on your own. Instead, call a poison control center at (800) 222-1222, or seek immediate medical attention. Finally, do not experiment with unfamiliar plants or take a plant's power lightly. Wear gloves in the garden; think twice before swallowing a berry on the trail or throwing a root into the stew pot. If you have small children, teach them not to put plants in their mouths. If you have pets, remove the temptation of poisonous plants from their environment. The nursery industry is woefully lax about identifying poisonous plants; let your garden center know that you'd like to see sensible, accurate labeling of plants that could harm you. Use reliable sources to identify poisonous, medicinal, and edible plants. (A great deal of misinformation circulates on the Internet, with tragic consequences.) I did not shy away from including plants that intoxicate, but I included them to provide a warning, not an endorsement. I confess that I am enchanted by the plant kingdom's criminal element. I love a good villain, whether it is an enormous specimen of Euphorbia tirucalli, the pencil cactus with corrosive sap that raises welts on the skin, on display at a garden show, or the hallucinatory moonflower, Datura inoxia, blooming in the desert. There is something beguiling about sharing their dark little secrets. And these secrets don't just lurk in a remote jungle. They're in our own backyards. 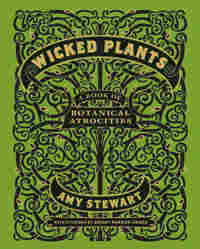 Excerpted from Wicked Plants by Amy Stewart. Copyright © 2009 by Amy Stewart. Excerpted by permission of Algonquin Books. All rights reserved. No part of this excerpt may be reproduced or reprinted without permission in writing from the publisher.